It is astonishing that a colossal Islamic scholar, Muhyiddin Ibn 'Arabî (AH 560-638), who lived more than eight centuries ago, should have declared that woman and man are absolutely equal in terms of human potentiality. He interpreted the "degree" which was given to man over woman as an ontological matter, abolishing singular male images of the universe in favour of a binary conjugal conception, where male and female are coupled together in a necessary cosmic unity on the level of both Creation and Gnosis. Muhyiddin Ibn 'Arabî has presented a new vision of woman in the history of Islamic Culture. It is indeed a vision worthy of inspiring contemporary Muslims, of acting as a foundation for the reassessment of their notions and concepts about women in Islam, and of propelling the wheel of cultural change in the proper path. For the purpose of outlining Ibn 'Arabî's vision, my research is divided into two main parts, each containing two subsections, that is a total of four, each holding the potential to be a springboard for a new wave of thought on the issue of women. Ibn 'Arabî views human reality as one in all human beings, males and females. The two genders are equal in respect of humanity, and that is their origin. Maleness and femaleness are contingent states in the human essence. He says: "Humanity unites male and female, and in it maleness and femaleness are contingencies, not a human reality." He also says: "Eve was created from Adam, and so she has two determinations (hukm), that of male by virtue of origin and that of female by virtue of contingency." Based upon this gender equality as human being, woman is qualified to work in all the same occupations as a man does, and possesses the aptitude for the performance of all intellectual and spiritual activities. In the following, we study a woman's aptitude for knowledge and spirituality. Texts preserve for us many reports from which one can prove the evident and direct participation of women in cultural and political life. This started at the time of the Prophet, the Companions, and lasted through the first few centuries of the Hijrah, until the dark ages when the role of the free woman in public life faded away to a role of owned slavery - whether by purchase or by capture as a result of war - in the field of arts and in the courts of rulers. This brought about a new kind of relationship of inequality between men and women, between a powerful authoritarian owner and a powerless owned, who would not shy away on most occasions from using guile and deception in order to achieve personal gain. In spite of the appearance of a breach in the life of men's and women's societies, sufi circles remained, for the most part, open to both genders, looking upon woman as a human being and not as a female, as a person with exactly the same aptitude for divine closeness and gnosis as a man. Ibn 'Arabî further developed the vision of the sufis who preceded him, with regard to women being people of knowledge and gnosis. Woman manifested in his works in two aspects: the sufi and thefiqh fields. This characterisation was personified by a woman of gnosis from Seville, Fatima bint al-Muthanna of Cordoba. In his youth, Ibn 'Arabî served her, himself, for about two years. This is longer than any period of time he spent in the "company" of a sufi gnostic, inasmuch as the words "serve" and "company" denote in sufi terminology, taking and learning from, being polished by association and company and service, all of which is unveiled by sufis in an educational method quite different from that of the faqih who requires intellectual force-feeding. When Ibn 'Arabî says "I served", it means he took the person served as a shaykh, a guide, and a spiritual teacher. Therefore, Fatima bint al-Muthanna was for Ibn 'Arabî all that a shaykh is to a murid. Ibn 'Arabî, the murid, acknowledged the role of the Sevillean gnostic in his rebirth, and accepted his spiritual descent from her, which he never did with any of the shaykhs he accompanied and served during his lifetime. She was the only one he called "my mother". And she used to tell him: "I am your divine mother, and the light of your earthly mother." The influence of this gnostic lady on the rebirth of Ibn 'Arabî appears in the few passages he relates in the Futuhat which include her contemplations and the gifts of sainthood that were granted to her. She used to say to Ibn 'Arabî for example, "I wonder at him who says he loves God and yet is not rejoiced by Him, for He is the one witnessed by him, His eye observes him in every eye, and He is not hidden from him, not for one moment." Ibn 'Arabî came to know her station when she told him that the Fatiha of the Quran served her. He learned first-hand when she recited the Fatiha for a matter she desired and he read with her. As a result of her reading, she created a three-dimensional ethereal image of the Fatiha, and asked it to carry out such and such an order. He also mentions benefiting from this gnostic lady's knowledge in the field of the science of letters, which is a science of saints. 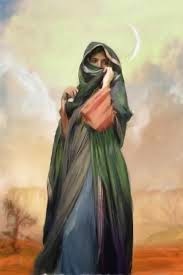 Therefore, the Sevillean gnostic manifested in the life of Ibn 'Arabî in the position of guiding saint and spiritual teacher, and he was not embarrassed to learn from her, or to surrender to her leadership, or to stand as a murid before her knowledge. This is practical proof of Ibn 'Arabî's declaration that a woman can be a shaykh and a spiritual guide, and that men are allowed to be among her disciples. So let no attention be paid to those who do not see that a man can be the disciple of a woman on the pretext of the mixing of the sexes, because historically and to this day, women have been numbered among the disciples of male shaykhs. The issue here is the aptitude for knowledge and learning, which allows a woman to take on her rightful role in the life of a disciple.